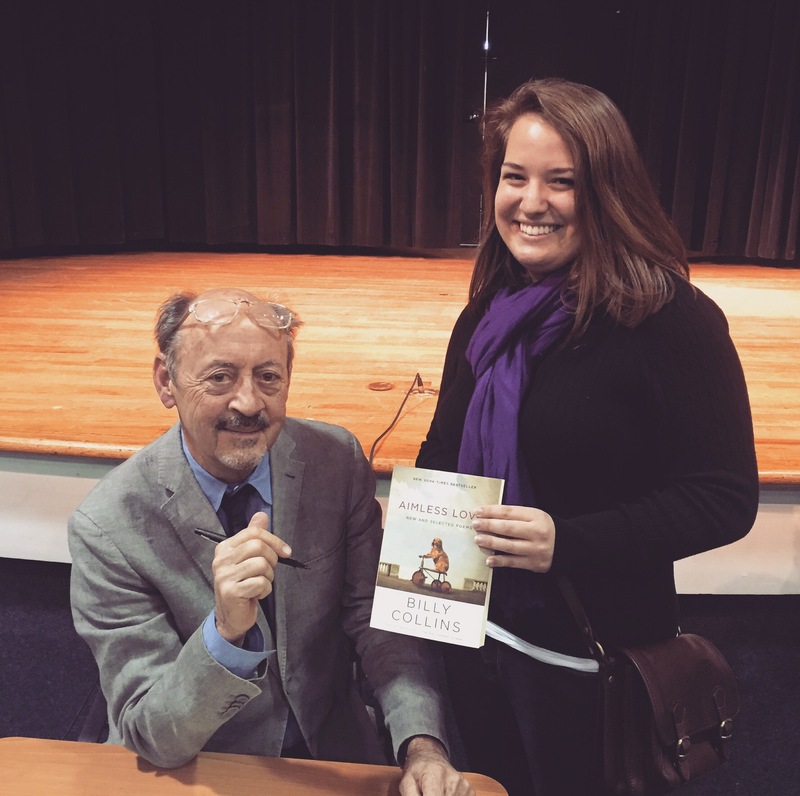 I think I’ve already mentioned somewhere before that I am a huge fan of Billy Collins– former U.S. Poet Laureate. His work is excellent to read, but I highly recommend finding one of his readings on YouTube because his delivery makes his work even more hilarious than it is on the page. About a month ago when I should have been paying attention in class, I dug through the Internet to find that he was doing a reading in Atlanta a week after graduation. That information fell by the wayside once I was in the hurricane of final exams and papers, but once the storm cleared, we (my mom and I) took a weekend trip to Atlanta for the reading. The Atlanta Writers Club hosted the event which was surprisingly small considering his notoriety. (We guessed that they just didn’t advertise too much because I wasn’t kidding when I said I was digging through the Internet to find the information.) My uncle went too which was nice because he first introduced me to Collins’ work when I was 17 which I continued reading throughout college. The reading was excellent. He read a bunch of my favorites and a few new ones from his book “The Rain in Portugal” that’s due next October. A perfect graduation gift to myself. And we got to meet him after as he signed books so I now have a signed copy of “Aimless Love” and a picture of him and me with a goofy English-major-meets-famous-poet grin on my face. The next day we went to the Buford Highway Farmer’s Market to poke around, but we mostly just bought a lot of cheese. The place is a massive international grocery store where you can get pretty much anything including live eels. (Spoiler: We don’t buy live eels.) Anglophile that I am, I wandered over to the British food section where they sold Mars Bars. I got pretty addicted to Mars Bars this summer because they sold them in the refectory at the university we stayed at in London. For some reason they always seemed quintessentially British to me, and now always remind me of the summer I spent in London. So basically I decided to get one at the Farmer’s Market the other day even though I’m pretty sure you can get them at Publix. But whatever. Cheers to the “exotic,”right? Decided to share only one of Collins’ poems because otherwise I’d copy and paste them all. Instead, here’s a link to his reading “Consolation” which I find particularly relevant as a traveller who isn’t traveling.